Hydrothrem is now offering a new series of test kits specifically designed for Educators and Environmental Science Students. These portable kits contain well constructed lessons and activities, and will allow the teacher to get the most out of their classroom time. Backpack Lab™ is designed with all the necessary components in one place, reducing the chance of misplacing an item. This durable backpack is ideal to take to the field for on-site measurements. With the excellent support of our brilliant professionals, we are engaged in presenting Soil Quality Educational Test Kit. Sulphate, carbon, and alkaline should have lower quantity presence in soil. 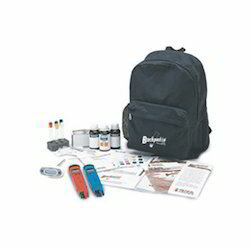 This kit helps in reading the chemicals value present in soil. Our professionals are high qualified and experienced in providing consultancy and educating clients for operating the kit wisely. Clients can get the solution from us at industry leading rates. Furthermore, clients can opt for refreshment training as per the requirements. Our organization takes pleasure to introduce its business as one of the leading entity Water Quality Educational Test Kit. This kit is manufactured using quality stainless steel and iron alloys. 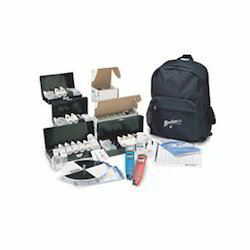 The kit is equipped with various indicating substances that help in reading the exact chlorine, sulphate and other pH values in water. Apart from testing the water from chemicals, it also read the infections, bacterial growth and particle present in water. Keeping track with the market development, we are engaged in offering Marine Science Education Test Kits. This kit tests the quality of chlorine, nitrogen, pH, salts and other harmful chemicals sands presence and level in marine water. The test kit also has the capability to check the exact water purification level for portability. There are only 180 tests that can be measured using the kit. This includes chemical and bacterial test present in liquid form. For water treatment plants, this kit provides the better solutions.